Optimize onsite search with part 2 of our complete guide. The second blog in our series on optimising the search experience looks at why shoppers ask the search box for help - the first step to successfully improve the finding experience. It's a good idea to think about the search box as the virtual equivalent to a shop assistant in a traditional brick-and-mortar store. You ask them for help because you feel that this is going to get you to the right product more quickly. When customers type in a search box, there are three reasons. The best case scenario for onsite search is when the customer already knows which product they want to buy. The shopper has already researched, and now the only thing that separates the retailer from a sale is getting that person to the right product. This kind of behaviour is particularly common in the electronics sector. Shoppers tend to research major purchases thoroughly and then search for the product name or reference with different retailers to see where the best deal lies. This is also common when shopping for books and other media, where shoppers have a specific title in mind. Similarly, when shopping for groceries online, many if not most products are purchased repeatedly, reducing the need for thorough product comparison and making it easier for the search engine to surface the right products. In fashion retail, customer behaviour is quite different. It's rare for shoppers to know precisely what product they want when they come to your site. Only a tiny fraction of searches are for a named product. A fashion search journey typically involves shoppers browsing a selection of related products and then picking the one they like best. Luxury brands can be an exception to this rule - think of Ray-Ban aviator sunglasses or a Burberry trench coat. Whatever the shopper is looking for, retailers need to make it as convenient as possible for them to reach the product. It should be a given that when the shopper executes a search the named products are the only results or at least at the top of the list. The experience can be improved by using product suggestions or instant results, which give even easier access to the product details. If you're certain the shopper doesn't need to do any additional research, you can take this idea even further and let them add the product straight to the basket, removing one step from the purchase path. 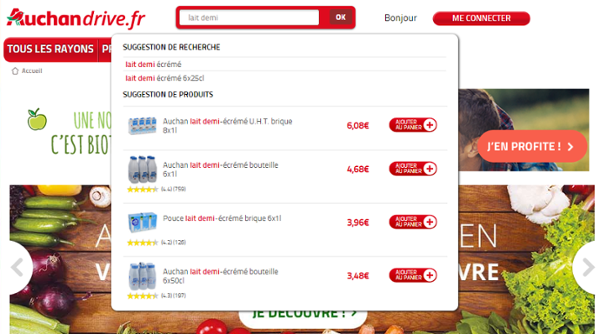 Auchan.fr does this nicely for groceries. If I simply want to buy the same semi-skimmed milk as last week I can do that straight from the search box, without having to click through to search results or product detail pages. Shoppers are generally lazy. They tend to readily adopt the navigation mode if that is most prominent. If the search box is easier to see and use, then they will predominantly go for this option. 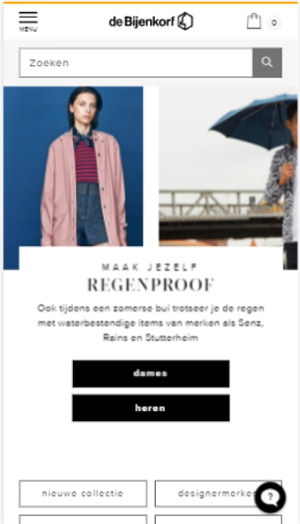 For example, De Bijenkorf, a premium Dutch department store, decided to channel shoppers towards search by placing the search box centrally on its mobile site, and then placing the category structure behind a button. It is hard to miss and an effective way to encourage shoppers to start their journey on the site by using search. In a separate study, we sampled search behaviour across our customer base and noticed that large and immediately visible search boxes lead to 75% higher search usage. So, perhaps placing your search box where no one can miss it is the online equivalent to greeting every in-store visitor with “Good morning, how can we help you today?" Shoppers learn quickly. If their preferred mode of navigation doesn't get them where they want to go, they will switch. You can imagine the offline equivalent: we all know department stores are often difficult to navigate, so you inevitably get lost and need to ask for assistance. The online equivalents are retailers overly complicated mega menus and poor faceted navigation which can confuse visitors. An easy way to see if shoppers are getting lost on your site is to check your web analytics data. Most systems can tell you which pages searches start from. For example, if you notice that many searches originate from product lists, you may have to review your facets and filters. If you then also notice that after visitors try searching they continue on the purchase journey, you have evidence that your customers prefer search. In this case you could also make search more visible too. Bear in mind that it's not always better to channel shoppers to search. It really depends on the industry you're in. If you are selling the latest fashion trends and have carefully curated and styled category pages you might be better off channelling customers to these areas. If, on the other hand, you sell hundreds of thousands of specific technical products with a complex menu structure make sure to promote your site search functionality. Knowing why search is used means we can design the search and navigation experience accordingly. If shoppers have very specific products in mind we need to make sure they get to the right results as quickly as possible. If search is used because it's easier or more visible than any alternatives, you will see many generic searches. In this case we should aim to help shoppers to better express what they really want. Look out for Part 3 next week on why helping customers express what they want is crucial for ensuring good quality search results.